Green River, Utah – March 10, 2012 – Well known Utah river rafting outfit, Holiday River Expeditions, is expanding their mountain biking tour program. The new trip will be called “Iconic Moab Day Rides” and it features four days of guided mountain biking in spectacular Moab, Utah. The trip is based out of luxurious Moab Springs Ranch. The level and ambition of the group on each particular ride will decide the difficulty and route of this extreme mountain biking trip. 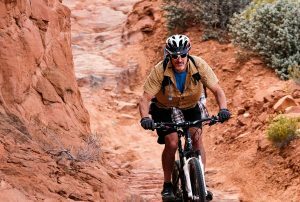 Groups can decide between such iconic biking trails as AmasaBaHck, the 24-Hours of Moab Loop, Klondike Bluffs, Sovereign Trail, Monitor & Merrimack, sections of the White Rim, sections of the Kokopelli Trail, or Onion Creek. Transportation to the rides, as well as breakfast and lunch is included. Biking groups will have the opportunity to ride world renowned trails like “Slick Rock Trail”. Groups will also experience challenging climbs, breathtaking views, and heart thumping descents in beautiful Canyonlands National Park. For over 40 years, Holiday River Expeditions has hosted guided white water rafting trips down the Colorado and Green Rivers and they offer many amazing rafting trips for every age group and skill level. All food and transportation is included in trip prices. Adventure seekers won’t find more exciting, fun or spectacular scenery anywhere and many visitors return each year to experience the thrill of mountain biking and white water rafting all over again.